The Syrian Civil War began in 2011, as peaceful protests for democracy in Syria turned violent with the Syrian government killing and imprisoning demonstrators. Regional and foreign supporters, as well as international intervention, has continued to complicate the civil unrest. The United Nations Office for the Coordination of Humanitarian Affairs (UNOCHA) reports that with over half the population forced out of their homes, the seven-year Syrian conflict is the largest displacement crisis in the world. Currently, there are 13.1 million Syrians requiring humanitarian aid. Of those, 5.6 million are refugees in the region and 2.7 million are child refugees. As of April 7th, 2018, a suspected poison gas attack hit the town of Douma killing several dozen people with at least five hundred individuals affected by the gas. 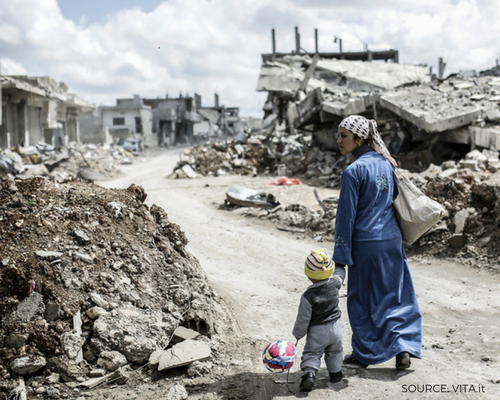 The Syrians impacted by the ongoing, bloody civil war depend upon humanitarian aid for food, clothing and shelter. The highly-rated charities listed here are providing these services and more (such as medical assistance and schooling for children). Be sure to consider what it is that you want your donation to accomplish and to find a charity offering that specific type of aid. Learn about the criteria used to create this featured list of charities.